Thanks: See credits section for full credit information. Sonic 3 Complete is a hack of Sonic 3 & Knuckles which aims to provide a much improved variant of the original game, with many new options and features, without straying from the original levels or gameplay. The inclusion of separate modes for Sonic 3, Sonic & Knuckles and Blue Sphere also make this a close cousin of the PC compilation Sonic & Knuckles Collection, albeit designed for the original 16-bit hardware. The following is a summary of some of the most notable changes included in Sonic 3 Complete. Please see the Full List of Changes and Options section for a more detailed list. The original Launch Base layout in action. The primary inspiration for the project's creation was the idea that Sonic 3's presentation got a lot of things right that Sonic & Knuckles changed for the worse. As such, the default setup for Sonic 3 Complete restores Sonic 3's audio and visual style for the whole game, including, amongst other things, the original main game themes, Knuckles' iconic Jacksonesque drumbeat and associated miniboss theme, the reflective lack of music in zone transitions, the original title cards and a lack of "and Knuckles!" exclamations glued in wherever possible. For the Sonic 3 zones, the original object layouts are available, and are used by default in most cases. Launch Base's tricky traps are hence restored to their full power, and watching your step during the Hydrocity wall chase is well advised. Perhaps most notably of all, the transition between the Sonic 3 and Sonic & Knuckles zones is much improved, restoring Sonic 3's final boss Big Arm for Sonic and Tails at the end of Launch Base, and providing a cutscene based on the Sonic & Knuckles title screen to bridge the gap. For those who aren't so set on Sonic 3 being the better half, it is possible to revert most of these changes using menu options or patches, and even to apply different musical configurations when playing the separate Sonic 3 and Sonic & Knuckles halves. It is commonly understood that Flying Battery Zone was originally intended to be played between Carnival Night and Icecap, but was moved around late in the development of Sonic 3. Sonic 3 Complete features an option to restore it to that position, with a suitably altered night sky, and a further optional change to the indoor colour scheme to match the unused save screen icon from Sonic 3 (which has also been restored). When moving from Flying Battery to Icecap, the snowboard sequence involves the broken exit door from Flying Battery, as was once planned. Mushroom Hill also takes its name from the Sonic 3 level select, Mushroom Valley, and a new transition takes you from there straight to Sandopolis if Flying Battery is moved away from its normal position. No more last-minute cast changes. A large number of tweaks and bugfixes have been made to smooth over rare and common issues in the game. Most bugfixes are always on and cannot be disabled, but subjective feature tweaks can mostly be reverted to the original behaviour. Rather than being the third wheel, the Tails experience has been upgraded: he now has his own intro sequence, like Sonic and Knuckles (whose Sonic & Knuckles intro has been moved to the start of the full game in Angel Island), his own continue screen, and his own colours on the results screen. A feature borrowed from Sonic 1 2013 allows Sonic, in a Sonic and Tails game, to have AI Tails start flying by holding up while double-jumping; Sonic can then be picked up by Tails and control Tails' flight, allowing him to explore further without having a second player present. The controls for Tails' flight in this mode can be toggled between Sonic 1 2013-style, in which player 1 directly controls Tails and down must be held while jumping to detach, or traditional Sonic 3-style as used during the Marble Garden boss, where player 1 can use the d-pad to direct Tails. One significant change affects activation of super forms; this now requires pressing a different button from the one last used to jump to transform in mid-air, allowing for usage of all double-jump abilities without forced transformation, and allowing Sonic to transform even if he has a shield. The same alternate-button double-jump can be used to cancel a super transformation. While transformed, rather than being forced to listen to the invincibility theme on endless loop, the default behaviour is to speed up the existing level music as if you had super sneakers. All of these changes can be reversed individually in the menu if preferred. Once you do activate Super or Hyper Sonic, you'll find that unlike the original game, the vast majority of his graphics now correctly reflect his change in form (though this does not currently extend to the Sonic 1 or Sonic 2 alternative sprite patches). Please see the Full List of Changes and Options for a more thorough listing. Please bear in mind that there are still many bugs from the original game in evidence, although many of the more problematic issues have been taken care of. In addition to switching between Sonic 3 and Sonic & Knuckles music, ValleyBell has created Mega Drive versions of the additional tracks exclusive to Sonic & Knuckles Collection, which can be used in place of the original Mega Drive tracks; the unused theme from that collection is available as alternative music for Super Sonic. Music based on the classic theme used in Sonic 1 and Sonic 2 is also available as an alternative. Easy mode springs - the antithesis of the Sonic 3 version. Sonic Jam's additional Easy and Normal difficulty modes are available, with their corresponding object layouts, slower special stages, and in the case of the former, reduced act count and easier bosses. These features are complemented by a new Casual Gameplay option, designed by Hayate and used in his "Casual" hacks, which allows game to be played without fear of death, for novices or a quick blast. The options menu allows Sonic's control method to be changed from his Sonic 3-style to mimic other games in the classic series. If you think the shield moves make life too easy, or you want a peelout move and unlocked roll jump in Sonic CD-style, these options provide an alternate experience. Taking the classic experience further, it is even possible to swap in sprite sets of Sonic and Tails that closely mimic their looks from Sonic 1 or Sonic 2, as well as reinstate the classic shields and/or monitors in place of their updated forms. The additional sprites used in Sonic 3 that never existed for those games have been faithfully recreated based on the available artwork. Due to the large volume of data involved in these changes, these options - along with a few other bells and whistles - are only available via the external ROM customiser, or through the IPS patches supplied below. The following contains IPS patches for the 130810 version, for those who prefer to apply optional patches manually rather than using the customiser. Thanks to everyone who has made comments or suggestions, reported bugs, or promoted Sonic 3 Complete through posts, articles and videos. Tracks for title screen, invincibility, Knuckles' theme, miniboss, 1UP, Sonic 3 ending, continue/race results, and data select are the Sonic 3 versions by default. Marble Garden 2 boss for Knuckles plays the standard zone boss theme. Flying Battery 2 sub-boss plays the Sonic & Knuckles miniboss theme. Hidden Palace plays Sonic 3 miniboss for Knuckles fight, Sonic & Knuckles miniboss for Emerald theft. The Blue Sphere difficulty screen now plays the Gumball Bonus music. Many of the Sonic 3 levels use their original Sonic 3 object layouts by default, most notably Hydrocity 2 and Launch Base. Knuckles' routes in these layouts were incomplete, but additions have been made to allow them to be played through. Sonic 1-3-style monitor behaviour - jumping under the base of a monitor will make it fall. Act music no longer resumes after the Got Through screen before a zone transition. Credits music has been replaced with the Sonic 3C 0517 version. Sonic/Tails have their final Launch Base 2 boss restored, with its Sonic 3 sweeping behaviour. The ability to hit characters out of their super form has not been reintroduced. In a Sonic and Tails game, Tails does not appear for the final Launch Base bosses. Player 2 can press a button to make him appear. The Continue screen uses title card-style text as it did in Sonic 3, rather than end credits-style text as it did in Sonic & Knuckles. Flying Battery shows up with its unused Sonic 3 icon in Data Select. Mushroom Hill is now named Mushroom Valley, as it was in the Sonic 3 level select screen. All references to "& Knuckles" removed, title screen positioning realigned to original setup. Zone title cards restored to Sonic 3's style. Playing as Sonic and Tails, Tails now arrives slightly later at the start of AIZ and faces right, as in Sonic 3, and cannot move until Sonic can. The save screen for Complete mode no longer shows counts of lives and continues (though these are still saved and loaded); its format has been made more compact, like the original Sonic 3 save screen. Emeralds on the save screen now use the Sonic 3-style flash cycle in all modes. 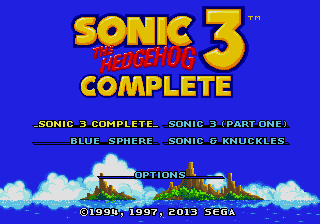 Before the original title screen appears, a game menu has been inserted to select between Sonic 3 Complete, Sonic 3, Sonic & Knuckles and Blue Sphere. Pressing from the title screens of any of these games will return you to this game menu. An Options menu has been provided to reconfigure many aspects of the game. The originally-conceived zone order can be activated using the options menu, placing Flying Battery between Carnival Night and Icecap. A "beta" palette of Flying Battery's indoor section can be put in place, which matches up with the previously unused Sonic 3 save icon. Sonic Jam's Easy and Normal modes are available, complete with their unique features and level layouts. Music from Sonic & Knuckles Collection converted by ValleyBell can be swapped in, as can imports of Masato Nakamura's main themes from the previous games. Many of the music changes designed to make the game more Sonic 3-like can be altered. Level layout can be switched between Sonic 3 and Sonic & Knuckles versions. The game can be set to boot straight into one of the game modes, bypassing the game selection title screen. Knuckles' introductory cutscene now plays in Angel Island rather than Sonic & Knuckles' first zone, and feeds directly into the level rather than fading out and restarting. Tails now has an introduction sequence, continue screen, and his own colours in the results screens. Added an extra cutscene after Launch Base, showing the Death Egg crashing, based on the Sonic & Knuckles title screen. Player 1 in a Sonic+Tails game can now put Tails into flight mode and direct him when being carried. This is activated as in Sonic 1 2013 (up+jump in midair). When Tails is carrying Sonic, use up/down/left/right to direct Tails, as in the Marble Garden boss. Alternatively, you can set the controls in this state to work as in Sonic 1 2013 through the options menu. Unless this feature is disabled, the fire shield dash will not activate while the up button is being held, to allow the characters to connect more easily. Super Sonic now has a full set of distinct sprites (for the default S3 look only). Some of these are based on flamewing's Sonic Classic Heroes sprites with tweaks by That One Jig; others have been drawn by Neo. Knuckles has improved and more consistent underwater colours. Knuckles' special moves now respect underwater physics. Hyper Sonic, Super Tails and Super/Hyper Knuckles now have distinct underwater palettes. The Mushroom Valley demo sequence now plays as one of the Sonic 3 demos. Sonic's Angel Island intro can now be skipped using the button (only until Knuckles interjects). For Super/Hyper forms to be invoked, you must press any button to jump, followed by a different button to double-jump. To transform with debug mode enabled, you need to double-jump by pressing while is held down. This allows Tails/Knuckles to play without powering up after having all emeralds. Sonic can now transform even if he has a barrier. Using the super transformation move while already transformed will allow you to turn back to normal. While in super or hyper form, sped-up level music plays instead of invincibility music. Super music changes now consistently have no effect during bosses. Speed shoes monitors now have no effect when collected in super or hyper form. You now need to collect 50 rings within the slot machine bonus stage itself to get a continue. Rings lost within the bonus stage will not take away from your collection total for the continue. You can now do this in every slot machine bonus stage. Originally, you needed to wait until a new act or lose your rings in the main level. Added a HUD element to the Slot Machine bonus stage to show progress towards a continue. The rotation in the slot machine bonus stage is now smoother (thanks to Cinossu). Separate title card icons for each zone, by Neo. Super/Hyper characters detransform if they are killed. Minor alterations to the Icecap intro to maintain day-night cycle consistency. The screen now pulls up after Carnival Night 1's miniboss, to make the signpost easier to control. New credits font designed to better fit with the title card style. on the Sonic 3 or Sonic & Knuckles title screen menu enables level select. With debug enabled, all restrictions on zone access and character choice are lifted, even in Sonic 3 and Sonic & Knuckles modes. "DEATHEGG" and "THE DOOMSDAY" changed to the more sensible "DEATH EGG" and "DOOMSDAY" in level select. Level Select now has the Data Select background, replacing the Sonic 2 SONIC/MILES pattern. In Sonic & Knuckles mode, the Blue Sphere background is used instead. Added entries to Level Select for the Gumball Bonus Stage and the Hidden Palace Special Stage entryway. Level Select has been rearranged to better reflect the actual zone arrangement. New icons have been added to the level select screen to better display character selection. New level select and data select font, designed to be similar in style to the title card font. This rectifies text spacing issues when displaying the final zones in data select. Sound effect 7F will now speed up music as if speed shoes were active when used in the level select. 7E returns to normal speed, as does starting another track. The sound test will always play Sonic 3 tracks from their original slots. The alternative versions can be played from entry F0 upwards. All monitor types are now available in debug mode. Knuckles appears in the same colours throughout the game, both in cutscenes and as a playable character. Knuckles now fights EggRobo in Flying Battery 2. Workaround added to Mushroom Valley 2 and Sandopolis 2 bosses to prevent Knuckles from sometimes seeing Robotnik instead of the EggRobo. You will no longer lose shields if hit from the blue spinning platforms in Marble Garden. The correct music will always resume when coming back from a special stage or bonus stage (Angel Island Zone 1, IceCap Zone 1). Fixed the HUD shadow colour in Angel Island. The underwater character palette now reverts properly when Tails or Knuckles lose their super form. When the lights go out in Carnival Night, the underwater palette also changes to reflect this (thanks to Neo). The slot machine bonus stage now awards a continue through rings collected in the slot machine as well as around the sides. Many player sprite and mapping issues have been fixed, and remaining Sonic 2-alike sprites have been replaced. Thanks go to That One Jig for these sprite improvements. Fixed a number of issues involving speed being incorrectly set when water and/or super sneakers and/or super transformations were involved (thanks to MoDule). It is no longer possible to confuse the camera by ducking and jumping in a wrapped level, thereby moving through objects (thanks to flamewing and redhotsonic). Rings attracted by the lightning shield are no longer confused by level wrapping (thanks to flamewing). The lightning shield can now successfully attract rings when the player is at the extreme top or left of the level (thanks to flamewing). Knuckles no longer shifts forward a pixel when looking up. The boss music gives way to the act music at the end of Sandopolis 1 and Lava Reef 2. The correct music will resume after a drown timer while fighting the Hydrocity bosses. Fixed issues with Tails flying Sonic into various objects and/or their areas of effect. Tails carrying Sonic to the floor no longer results in Sonic being able to walk around during level results. Sonic will no longer gain strange physics when Tails smashes an ice block from under him. Fixed occasional glitched graphics/animations for Sonic when Tails places him on the ground. The camera vertical offset will now reset when Tails carries Sonic. Fix for some giant rings in Mushroom Valley/Hill not appearing when continuing a save imported from Sonic 3. Tails alone no longer has extra tails in the Launch Base Zone 2 ending cutscene. Fixed Super Sonic appearing in the wrong pose when dropped by Tails (visible during the final Marble Garden boss). 2P Tails is less prone to suicide before the final battles of Launch Base Zone. Fire dashing or spindashing into the Death Egg boss area no longer causes collision issues. In certain circumstances, it is possible to break Launch Base pipes containing water without following the water through the tube. Going offscreen would cause the water jet to be lost, rendering further progress impossible. The water jets now respawn correctly. The initial restart locations for Act 2 of Angel Island, Hydrocity, Launch Base and Lava Reef now better reflect the act 1 finish positions, making time results more comparable. Attached platforms and objects are removed after the Launch Base building collapses. The capsule at the end of Hydrocity is now correctly centred for Sonic and Tails. SONIC text is no longer backwards when the Tornado flies left during the ending. Sonic's exit from Lava Reef to Hidden Palace is now blue rather than red. The music tempo glitch at the beginning of Doomsday has been removed. Collecting extra lives will not increase the counter past 99. Fixed possible Marble Garden 2 boss corruption after killing a Spiker with hyper dash. The normal super transformation sound effect is now used in Doomsday. Fixed bugs relating to the Icecap act transition: you can no longer fly over the boss, and dying without having hit a starpost will correctly return you to the start of Icecap 1. Fixed spring artwork occasionally not being loaded for the Gumball Bonus Stage. It is no longer possible to gain additional lives for having 100 and 200 rings in the Lava Reef boss area if those lives were already earned earlier in act 2. Robotnik's bald shine on the save screen is no longer red. The Launch Base music now only restarts once after Knuckles defeats the Act 1 boss. Knuckles no longer turns into Sonic at the end of the slot machine bonus stage. Various double jump fixes for Sonic, mostly involving unintentionally going into a slow bubble bounce by double jumping right before a bubble shield activated. Fixed bug where a time over would not restart the starpost timer after continuing from a game over. Fixed final Launch Base boss code to release Sonic from the arm after the boss is defeated - this was firing in the wrong situation, making Sonic always drop to standing after clearing the boss, but leaving him stuck if Tails killed the boss while Sonic was held. Fixed object and ring layout oddities in various zones, including the infamous double ring in Angel Island 1 and the improperly retracting spikes in Carnival Night 2. Super Tails' flickies no longer ruin the Sandopolis miniboss or the first Death Egg 2 boss. Fixed Tails using the wrong sprite when hit by the boulder in Lava Reef. The Death Egg no longer appears in the background of Lava Reef when playing as Knuckles. Tails will drop out of flight mode if he is tired and hits a diagonal spring in Carnival Night, preventing him from getting stuck. Incorrect grabber arm sprite on DEZ final boss fixed - now uses the latched rather than open variant. Workaround added to avoid occasional loss of music track change if requested during the 1up sting. Stopped 2P Tails from being able to misfire the cannon at the end of CNZ. Tails now shows his full victory animation on the Blue Sphere difficulty screen. Fixed players standing in the ground during their victory animations if they were previously rolling. Sonic and Tails can no longer use super powers to break the switch back into Knuckles' route at the end of Launch Base. In a Sonic alone game, Tails no longer gets stuck jumping on the ground after flying Sonic in. Fixed rare issue where the AIZ2 cutscene bridge collapse would trigger too soon. Fixed a rare situation that could freeze the player in place if transforming just as the timer expires (thanks to flamewing). The Sky Sanctuary main melody is no longer muted by ring collection. It is no longer impossible for Knuckles to defeat the Death Egg miniboss. Fixed CNZ vacuum tube whose art was pointing in the wrong direction. Follower Tails now behaves more sensibly at the end of Mushroom Valley/Hill. Fixed abrupt/unsynced camera/music transition at the end of Sandopolis 2. The rumbling sound during the closing sequence of Flying Battery is no longer missing when restarting from the final starpost. The falling animation is used after the Mushroom Valley/Hill Knuckles cutscene instead of the walking animation. Fixed odd palette cycle stop point on Super/Hyper Knuckles during his ending. Fixed Sonic incorrectly appearing as Hyper Sonic briefly during the ending when he shouldn't be able to. Jump height off Hydrocity rotating cylinders is now appropriately reduced when underwater. Competition music no longer restarts while navigating competition menus. Debug: Hyper Knuckles can now wall smash when turned hyper by a monitor. Debug: Tails' ring counter now falls in Doomsday. Debug: Characters other than Sonic appear correctly in Doomsday. Debug: Knuckles exits Doomsday to the title screen instead of a broken Sonic ending. Debug: Going into debug when dead now restarts object processing. Debug: The debug cursor now respects screen locking. Tails has been added as a playable character in Blue Sphere. While playing a special stage through Blue Sphere, pressing while paused will return to the Blue Sphere select screen. Pressing on the Blue Sphere menu screen will now return to the title screen. Your progress will be retained until you reset or turn off the game. The included Sonic 3 runs completely on top of Sonic 3 Complete's engine, and hence inherits all relevant improvements from Sonic 3 & Knuckles and Sonic 3 Complete, while retaining its own layouts, save files, bonus stage structure, etc. The credits list used is from Sonic 3 & Knuckles to reflect the integration of the games in this collection. On the "Try Again" ending screen, the emeralds juggled by Knuckles are now coloured correctly. The Death Egg's behaviour at the end of the game has been slightly altered to match the complete story. Tails retains his unique game clear icons on the save screen. If no saves are present for Sonic 3 mode, the game will attempt to import data from the complete game where appropriate. Skip the game select screen and start one of the individual games immediately on boot up. Play through the "Easy" and "Normal" versions of the game introduced in Sonic Jam. Use the full set of Sonic 3 or Sonic & Knuckles level layouts. Play Flying Battery in its original position between Carnival Night and Icecap, and/or with an earlier colour scheme design. Disable the added ability for Sonic to control Tails' flight, or swap the carrying controls for those used in Sonic 1 2013. Choose between the various soundtrack options for individual tracks, including Sonic & Knuckles Collection and Nakamura themes, or configure the game to use different soundtracks in each mode. Go back to using the invincibility music for super/hyper transformations, or use the unused PC track for this purpose. Change the moves and abilities available, so that the game plays more like other classic Sonic games. Use the original Sonic 3 & Knuckles double-jump/transformation button setup (any double-jump invokes a super form transformation, if available, unless Sonic has a shield, which prevents transformation). Disable the ability to cancel out of super or hyper forms. Use player sprites and palettes styled based on Sonic 1 or Sonic 2. The sprites were put together by That One Jig and Neo. Use monitor sprites based on those seen in the first two games, also edited by That One Jig. Remove elemental shields and replace them with Sonic 1 or Sonic 2-style shields. Disable the Big Arm boss in Launch Base 2 (use the Sonic 3 & Knuckles sequence). Use the original ending music (Sky Sanctuary instead of Sonic 3 Credits) - this can be set separately for Sonic's and Knuckles' endings. Start the Sonic 3 Credits music with the credit sequence (best used when the ending music has been changed back to Sky Sanctuary, otherwise the below patch is more useful) - this can be set separately for Sonic's and Knuckles' endings. Allow the ending music to continue through both into the credits - this can be set separately for Sonic's and Knuckles' endings. Require 50 rings in Complete mode instead of 20 at a starpost in to access a bonus stage, as in Sonic 3. Always play Gumball bonus stages in Complete mode, as in Sonic 3. Use the Sonic 3 credits music as the level music for Hidden Palace. Revert to using the original title card act icons for every zone. Restore extra lives and continues information to the Complete save screen. Revert to the original, incomplete set of sprites for Super Sonic. The menu setting to change the S3 Credits music to the Sonic & Knuckles Collection version does not affect the final credits if the customiser patch is used to place this track in that position. This will be resolved in a future release. This does not affect anything in plain, uncustomised builds. Changes made in the Options menu will not be saved to or loaded from SRAM when using the Regen emulator. This is seemingly due to Regen limiting the size of SRAM and does not affect flashcarts or any other tested emulators. It is still possible to use the menus if desired, but changes will not be saved after a hard reset or closing the emulator. Savestates may be used to preserve selected options. The emulators Generator and Genesis Plus (non-GX) appear to treat banked SRAM incorrectly, leading to part of the game becoming corrupted. The effects vary from build to build, as the damage is isolated to a particular ROM location which contains different data in different versions. As of version 130810, this causes Mushroom Valley to be severely damaged and essentially unplayable. Once again, this issue does not affect usage on real hardware or other tested emulators. If you like Genesis Plus, note that emulators based on Genesis Plus GX do not exhibit this issue. Many known issues in Sonic 3 & Knuckles continue to be present. This page was last edited on 19 September 2018, at 03:08.